On the 2nd February 2009 I came across, and signed up to, a cashback site called Quidco. From what I gathered anything members purchased online you were paid cashback on. I didn’t think it would amount to much but I thought it was worth a shot. What did I have to lose? Is Quidco really free money? When telling Hubby about this new website his immediate reaction was “Free money? How can they do that? I don’t believe it.” This was a conversation we had regularly over the next few weeks and I had to agree – I had no idea how or why a company would give you free money, it didn’t make sense. It was not a concept I had ever heard of before. Zoom forward 4 years and I have been paid £1265.49 by Quidco and still have £77.85 to be paid at some point. We are now in our fifth year of being signed up to Quidco and we no longer ask how or why they pay you free money, we only ask why we didn’t sign up sooner! How much can you earn through Quidco? Where can you earn cashback through Quidco? How have we earned cashback with Quidco? Over the years we have had cashback on all manner of things – £150 back on a mobile phone contract, £166 back on a holiday to Las Vegas, £50 on car insurance, £35 on Pet Insurance and smaller amounts on our regular online purchases. Most things you can now get cashback on – we have even had cashback when transferring our utilities over to a new company and when booking our MOT at a local Halfords. Is there anything else we should know about Quidco? There are a couple of things you should know. There are two Quidco levels of service, standard and Premium. To have the Premium service you pay £5 a year from the cashback you earn. Other than this, my Quidco is free. When we signed up there was only the one level of service with the £5 fee and recently they introduced the standard free service. The Premium service offers you Faster Paying Retailers, Premium Quidcare Support, No Sponsored Advertising and Bespoke promotions & loyalty bonuses. It would say that it is more than worth the £5 a year and you won’t even notice you’re paying it. With Quidco you are also able to register bank cards to take advantage of in store cashback on retailers such as Debenhams and Halfords. Add to this the Mobile App where you get to ‘check in’ at shops for 20p here and 15p there, Quidco has a whole multitude of ways to save and the cashback rates vary between retailers. There are terms and conditions with each retailer when you are getting cashback. These usually state the time it takes for the retailer to pay as well as the standard ‘cashback will not be paid when a voucher code has been used’. Quidco has voucher codes on it’s website, and you are able to use these but none from a third party source or your cashback may be declined. Also if your purchase doesn’t go through for any reason, you cancel an order or something, the cashback will be declined. Is cashback through Quidco guaranteed? The one piece of advice I would give is you shouldn’t buy anything just to get the cashback – in all cases the cashback isn’t guaranteed, but more than likely it will be paid. We haven’t had any major instances where it hasn’t gone through. Also, keep an eye on everything you have bought and make sure it shows on the Quidco site as ‘tracked’, if not you can contact Quidco and they’ll investigate it for you. I have done this many times and it’s always a straight forward process. We have only ever used Quidco to buy things that we were buying any way. This means that any cashback we have received really has been ‘free money’. Stick to that concept and you’ll never be disappointed by Quidco. How quickly will I earn cashback through Quidco? 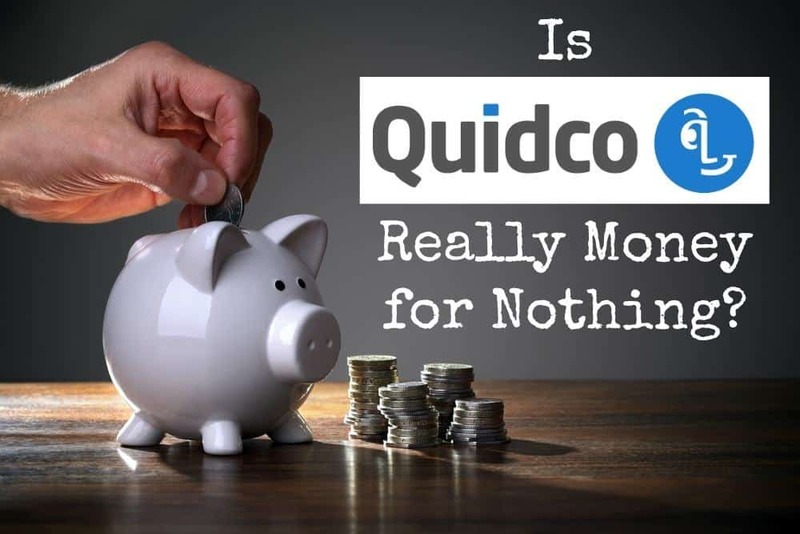 Is Quidco really money for nothing? Does Quidco work? So, Quidco, Money for nothing? Yep, pretty much. Signing up to Quidco membership has given me £250 a year that I wouldn’t have had otherwise in Quidco cashback and it will keep giving me this small income indefinitely. I will always use it to buy any insurance policies, whenever my mobile contract is up for renewal and every time I buy something online. I just wish they could give me cashback on my weekly grocery shop! Are there any disadvantages of Quidco? Well, no, not really. With any cashback site the cashback isn’t guaranteed and it’s recommend that you delete cookies before going through Quidco and completing your transaction. It also doesn’t work in conjunction with many other discount codes and third party offers. But, I honestly don’t have anything negative to say about Quidco – I love the service. If you haven’t complete the Quidco sign up yet, join Quidco now. There aren’t many times in life where you’re given something for nothing. Everyone loves free money and Quidco is one of the best cashback sites I have ever used. I recently signed up to Quidco, and I’m incredibly impressed. The mobile check ins and local deals are very handy too! I think I will sign up to this. I’ve been wondering about it for a while but never really understood it. Thank you for this post. Every penny matters in our house so this will be very useful.